Heavy monthly bleeding: When is it too much? The risks of untreated anemia due to abnormal blood loss each month include fatigue, dizziness, irregular heart rhythms and cognitive problems. Heavy bleeding from fibroids and other GYN conditions can lead to anemia, a condition that needs to be managed on multiple levels. This can include iron supplements, iron infusions, or blood transfusions. Ultimately, GYN conditions need to be treated effectively to get to the root cause of the excessive blood loss. How can you tell when monthly period flow is too heavy? Blood test results can show if you are anemic, but there are other indicators that can help you decide if you need to see a specialist. The normal interval between menstrual periods is 21 to 35 days. Most women have a duration of flow of no more than seven days, and lose no more than 80 cc (or 2.8 ounces) of blood with each cycle. Women with an interval less than 21 days or greater than 35 days, with menstrual flows greater than seven days’ duration, or with more than 80 cc of blood loss have abnormal bleeding. It is important to monitor your symptoms and make sure to seek treatment if they worsen. Other things to watch for are soaking through super tampons within an hour, soaking through menstrual pads, and of course signs of anemia. Your body needs iron to make a protein called hemoglobin. This protein carries oxygen which is essential for tissue and muscles to function effectively. When there isn’t enough iron in the blood stream, the rest of the body can’t get the amount of oxygen it needs. Blood loss is the most common cause of anemia. In addition to the loss of red blood cells from the body, which your bone marrow must replace, loss of iron that is contained in these cells will ultimately lead to iron deficiency once tissue stores have been depleted. Iron deficiency associated with chronic bleeding leads to a reduced bone marrow response, worsening the degree of anemia. 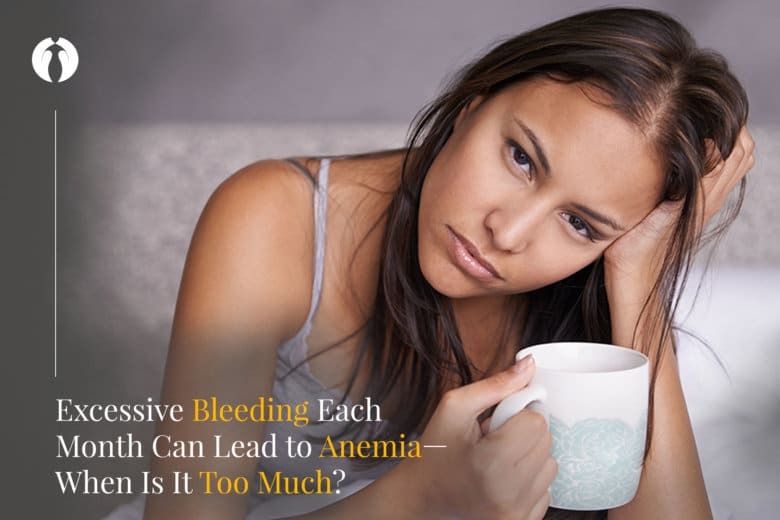 Knowing the dangers of anemia can help women get ahead of potentially life-threatening complications such as congestive heart failure, angina, arrhythmia, and/or heart attack. Approximately 25 percent of reproductive-age women have absent iron stores, and any amount of bleeding will result in anemia for them. Iron deficiency in the United States and Western Europe is almost always due to blood loss. Fibroids within the uterine lining (submucosal) can cause severe bleeding, even if they are small. These fibroids can increase the area of the lining, and also increase menstrual flow and decrease the normal ability of the lining to stop the bleeding. Fibroids within the uterine muscle (intramural) that are larger or close to the cavity will increase blood flow to the uterus and affect the normal systems that control bleeding in the uterus. These fibroids will also increase the size of the cavity of the uterus, thereby increasing bleeding. Increased bleeding in the uterine cavity due to these types of fibroids can result in the formation of clots. Pain is caused by distension of the womb and passage of the clots. Many women pass very large clots and have extreme pain with their menstrual cycle as a result. Thoroughly removing fibroids from the uterus laparoscopically can only be performed by a highly skilled minimally invasive GYN surgeon. Myomectomy procedures performed as robotic or standard laparoscopic procedures cannot allow the surgeon the added benefit of being able to feel the fibroids, and open procedures can take months for recovery. Fibroid removal surgery can be performed as a myomectomy, removing the fibroids from the uterus, or as a hysterectomy, removing the uterus itself. A myomectomy is performed for women who are of childbearing age, and who wish to retain the ability to get pregnant. A hysterectomy for fibroid removal is performed for women who no longer wish to get pregnant, and who suffer from recurring fibroids. Standard laparoscopic or robotic techniques do not allow a surgeon to feel the fibroids, and often, those that are left behind become problematic. Depending on your future plans for fertility, it is important to find a surgeon who will work with you as a partner, and who can perform either procedure through minimally invasive techniques, such as LAAM® or DualPortGYN®. A delicate procedure like a myomectomy requires the ability to feel in order to create the best possible result. A successful myomectomy requires the surgeon to remove fibroids often deep in the muscle of the uterus that cannot be easily seen. It also requires the surgeon to remove all of the fibroids, including smaller ones that can only be located by feeling them. LAAM is a minimally invasive fibroid removal technique that allows the surgeon to feel all of the fibroids at any location in or around the uterus, and allows for their safe and effective removal no matter the size. A DualPortGYN hysterectomy is one of the most minimally invasive GYN surgery techniques available. A hysterectomy is the most effective way to eliminate fibroids. Once the uterus is removed, fibroids cannot regrow. It is important to understand what a hysterectomy entails, and to choose a skilled minimally invasive GYN surgeon who will explain in detail what will happen during and after the surgery. Dr. Paul MacKoul and Dr. Natalya Danilyants are minimally invasive GYN specialists who developed the DualPortGYN and LAAM techniques used at The Center for Innovative GYN Care. These advanced techniques allow women with complex conditions such as large fibroids, extensive endometriosis, adenomyosis, and pelvic adhesions to have outpatient procedures with fast recovery. Book a consultation to learn more about expert treatment of complex GYN conditions.